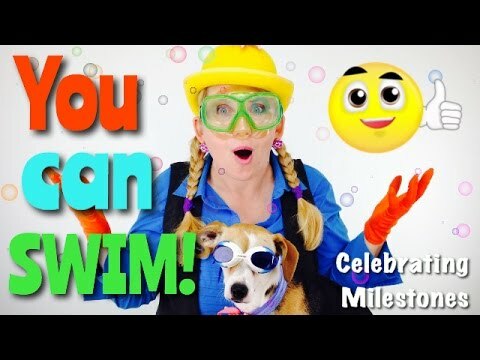 Celebrating Milestones – You can SWIM! Keep SWIMMING! WOW! Did your sweet one just learn how to SWIM? AMAZING! Now Just keep swimming just like Dory! And as another reward…perhaps let him or her watch a couple episodes of the Jelly Belly Schmelly Show! Here are a few short fun episodes they will for sure want to see! Shelly & Cocoa have the fun YouTube kids show called “The Jelly Belly Schmelly Show!” This is the funnest kids show about balloons, clues, play, puppies, surprises, popping balloons, being silly and learning colors and numbers. 😉 In every episode I will give clues as to the balloon I am making in the video. It is a fun surprise! I also use balloon pops for counting and say “Hi!” to all my friends with my special magic glasses. Cocoa the dog joins me in the episodes. For children ages 2-8 years old…and the young at heart! Have a HAPPY DAY!! !